Secretary of State Mike Pompeo speaks at the Heritage Foundation, a conservative public policy think tank, in Washington, Monday, May 21, 2018. U.S. Secretary of State Mike Pompeo has unveiled a far-reaching list of demands for any new nuclear deal with Iran, and threatened economy-crushing sanctions if Tehran does not change its behavior. The 12-point list of demands came in a Monday speech at the conservative Heritage Foundation that laid out the Trump administration's strategy after pulling out of the Iran nuclear agreement earlier this month. Under any new deal, Pompeo insisted, Iran must indefinitely abandon nuclear weapons work and provide United Nations inspectors access to sites anywhere in the country.He said Tehran must also end its proliferation of ballistic missiles and stop its "destabilizing activities" across the Middle East. If Iran does not change course, the U.S. "will apply unprecedented financial pressure," Pompeo warned. "These will be the strongest sanctions in history by the time we are done," said Pompeo. "The [Iranian] regime has been fighting all over the Middle East for years. After our sanctions come into full force, it will be battling to keep its economy alive." 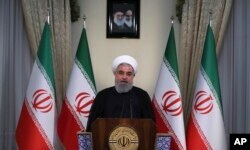 Iran's President Hassan Rouhani dismissed the threats. "Who are you to decide for Iran and the world?" Rouhani said in a statement published by Iranian state media on Monday. "The world today does not accept that the United States decides for the world. Countries have their independence." FILE - In this photo released by official website of the office of the Iranian Presidency, President Hassan Rouhani addresses the nation in a televised speech in Tehran, Iran, May 8, 2018. The Trump administration has vowed to reimpose sanctions that were lifted as part of the 2015 nuclear agreement, which was signed between Iran, the United States, and several European countries, as well as Russia and China. Washington has also imposed additional sanctions. 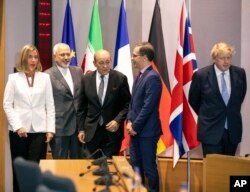 European countries are holding talks with Iran to try to salvage the deal. But it's not clear whether the effort can succeed. On Sunday, Iran's foreign minister, Javad Zarif, said the European Union's "political will is not enough to preserve the deal." EU foreign policy chief Federica Mogherini reacted to Pompeo's speech Monday by saying there is "no alternative" to the existing agreement, formally known as the Joint Comprehensive Plan of Action (JCPOA), and that European nations are already using sanctions to pressure Iran to change its behavior. "Secretary Pompeo's speech has not demonstrated how walking away from the JCPOA has made or will make the region safer from the threat of nuclear proliferation or how it puts us in a better position to influence Iran's conduct in areas outside the scope of the JCPOA," she said. Though some European businesses have said they will comply with the U.S. demands and stop doing business with Iran, some European leaders have threatened countermeasures to offset the effects of U.S. sanctions. That would make it more difficult for the U.S. to apply tough economic pressure on Iran. In his speech, Pompeo acknowledged that many U.S. allies will suffer "financial and economic difficulties" because of the reimposed sanctions. "We want to hear your concerns," Pompeo said. "But you should know that we will hold those doing prohibited business in Iran to account." (L-R) European Union foreign policy chief Federica Mogherini, Iranian Foreign Minister Javad Zarif, French Foreign Minister Jean-Yves Le Drian, German Foreign Minister Heiko Maas and British Foreign Secretary Boris Johnson pose for a photo during a meeting of the foreign ministers from Britain, France and Germany with the Iran Foreign Minister and EU foreign policy chief Federica Mogherini, at the Europa building in Brussels, May 15, 2018. Getting significant multilateral buy-in for U.S. sanctions is key to effectively pressuring Iran, but could take a while, said Benham Taleblu, a research fellow at the Foundation for Defense of Democracies. "It took a decade for the West to get the Joint Comprehensive Plan of Action. It probably will take a significant amount of time to get a genuine fix for the other Iranian problems," he said. Pompeo's list of demands were wide-ranging, a reflection of the Trump administration's multipronged criticism of the Iran nuclear deal. According to Pompeo, Iran must "verifiably abandon" nuclear weapons work "in perpetuity." It must stop uranium enrichment and "never pursue" plutonium processing. It must provide the IAEA with "unqualified access to all sites throughout the country." It should end its proliferation of ballistic missiles. And it must release all U.S. citizens, "as well as citizens of our partners and allies." Pompeo also demanded Iran stop supporting Middle East militant groups, including Lebanon's Hezbollah, the Palestinian Hamas group, the Houthi militias in Yemen, as well as Taliban forces in Afghanistan. "I'm afraid that Pompeo is substituting ultimatums for diplomacy," said Jamal Abdi of the National Iranian American Council. "It just doesn't add up. This is not what a rational actor would respond to." "What we've learned," he added, "is that as much as we disagree with Iran, they do conduct things with a cost-benefit analysis of a rational actor. And Pompeo has not presented any sort of pathway they could actually comply with." Reza Pirzadeh, a political officer of the Iran National Council for Free Elections opposition group, founded by Iran's exiled crown prince Reza Pahlavi, said Pompeo's demands did not go far enough. "We want to insist on the freedom of all political prisoners in Iran. Also, we want to see freedom of speech, freedom of thought and social and cultural freedoms for the Iranian people," he said. "We want Pompeo to emphasize [these additional demands] in any negotiation with Islamic Republic officials in upcoming discussions involving the EU, U.S. and Iran." On Monday, a Pentagon spokesman said the U.S. will be taking steps to "address Iran's malign influence and destabilization actions" but declined to comment on any specific moves. "We are assessing if we are going to double down on current actions or implement new actions." said the spokesman, Colonel Robert Manning. "We're not going to rule out anything in order to address Iran." Jeff Seldin and Shahram Bahraminejad of VOA's Persian service contributed.